Purchased this (and another) for 2 small half baths as I needed something very narrow in order to maximize the space. The size and projection of these sinks was just perfect. Just be aware that they're very narrow and you really don't have much "top surface" to set things/soap/decor on. Dimensions 9.0 In. X 20.0 In. X 6.0 In. Perfect solution to a small space. It did have some chips around the faucet hole but was covered by the faucet. I thought I was getting a Right side faucet but it was not. It was not clear as the picture is R.
Awesome sink. Small, good looking and easy to mount. 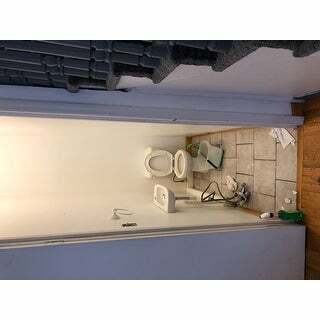 You may need to get another wall anchor but over all made a really awkward bathroom into an new bathroom. Packaging was solid and it came sooo quick. Thanks overstock! I love this tiny sink! Our main bathroom in our home is unfortunately tiny, but this sink works perfectly to make it seem more spacious and maximize the floor space. Be aware that there is just enough space to keep a bottle of hand soap on the ledge and not much else, so you will need to plan ahead for what to do with your toothbrushes, toothpaste, and other bathroom storage needs. Overall, highly recommended if it fits your needs! This sink is so cute and it's a perfect fit for my bathroom. I'm in a wheelchair and needed extra clearance in a narrow bathroom, and this fit just right. Well made and easy to install also. This provides exactly what it's name suggests, a hand-rinse sink. I wouldn't recommend it for much more than a 1/2 bath or tiny house. I am using it in our 1/2 bath under the stairs with the typical configuration of toilet set back under slope and sink against the tall wall with a narrow door to enter. The sink doesn't impede getting in or out. It's beautiful and streamlined. I priced this at a local plumbing supply place and it was about $120 more than priced here. Love it. We bought this for our compact bathroom. The size to true in instruction. We are happy about this buy, so far no problem. Although it looks small, it functions well. Tiny, truly tiny sinks are hard to come by in this country and this sink is so cute, well made and perfect for a tiny space like my half bath that I made out of a closet. Love this sink! Exactly what I expected. It's perfect for small bathrooms as it's sleek against the wall. I was worried the sink would be too shallow but not the case! The best solution for a small 1/2 bath. Best sink ever. I needed a small sink for a tight space. Nice sink . I needed it for a small bathroom and it worked out wonderful. Super Cute! Looks perfect in my small toilet connected to large bathroom. Just right right for a hand washing sink. Does not splash- I was concerned about oversplash, but it is a non issue. "does this sink come with the faucet as shown?" "Can the sink be mounted onto a cabinet (dropped in)?" This is a wall mounted sink. "Does the mounting bracket come with the sink?" This basin does include the mounting hardware. This runs in at an approximate weight of 16 pounds. "Hello, Where does the hot and cold water enter the sink? Does it come up from the bottom of the sink (from the floor) or does it come in thru the back (from the wall)? I need it to come up thru the bottom of the sink from the floor and I can see from the pictures nor are there any specifications - thanks." Hello CrowsNest, this sink has the water supply coming from the wall. Thank you for shopping with us! "Is this right side or left side faucet mount? There are pictures for each." Hello jcarino, we do apologize for the confusion. 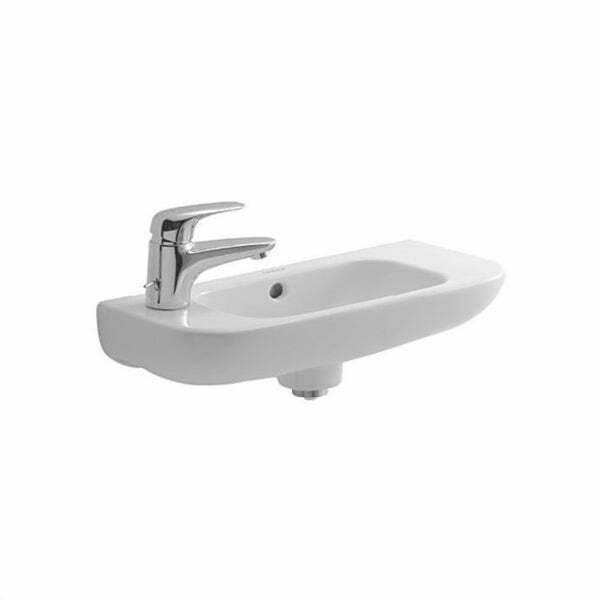 This item is features with the left hand mounting faucet. Please feel free to contact us again with any further questions. Thank you for shopping with us! "Does this sink require a drain assembly? Before coming across overstock, all other sites said their other sinks (not this Duravit) still needed drains to be purchased separately. Besides the Faucet, are there any other parts that are suggested/need to be purchased to make this fully functioning?" Hello FixerUpperNYC, the basin arrives with an overflow and tap platform as well as the mounting hardware. Thanks for shopping with us!